The Real Fight for Beauty is a digital parody of an exhibition and book Fight for Beauty by Ian Gillespie, Founder of Westbank, a Vancouver-based real estate development company that is not a culture company, but a culture-displacing one. This satirical website is a homage to the real fights for beauty by Vancouverties. It aims to expose the hypocricy of Westbank's self-serving exhibition that co-opts the arts and culture for corporate PR puroposes, while their real estate developments displace and destroy neighbourhoods and affordability in Vancouver. We need to take back the narrative of what is the real fight for beauty. This parody website is best enjoyed when you also view and read the original Fight for Beauty website. How you can contribute to The Real Fight for Beauty? 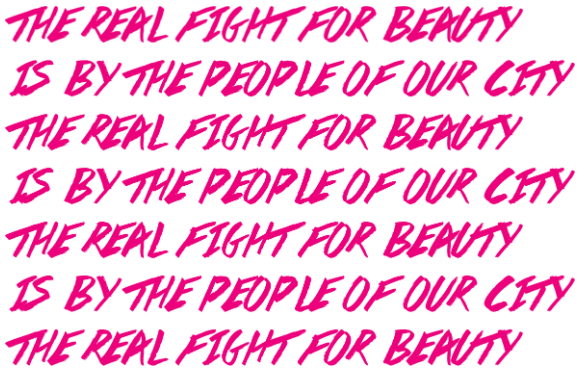 - On Instagram and Twitter, tag photos of real fights for beauty in Vancouver with the hashtag #FightForBeauty. - Send us original photos or videos of real fights for beauty in Vancouver or commentary info@therealfightforbeauty.ca. Examples here. - Send us articles or videos for blog posts to info@therealfightforbeauty.ca.